The brief for UK Postbox was to help position them as the UK’s leading Online Post Office. While their services offered everything to achieve this goal, their overall brand identity was outdated. Bright colours, use of stock imagery and the whole brand identity didn’t do this growing business justice. They came to us to help them make the right 1st impression by bringing their services to life and making their content more engaging. Initially, we set out to help our client stand out from their competitors. They didn’t want to be seen as yet another website with loads of stock imagery, that looks much the same as everyone else online. We decided that the best way to achieve this was through the creation of bespoke illustrations, showcasing each service and all in a distinctive style. For our client, it was essential to convey trust and professionalism while embracing their UK based services. These factors played a big part when we set about choosing the new colour scheme. 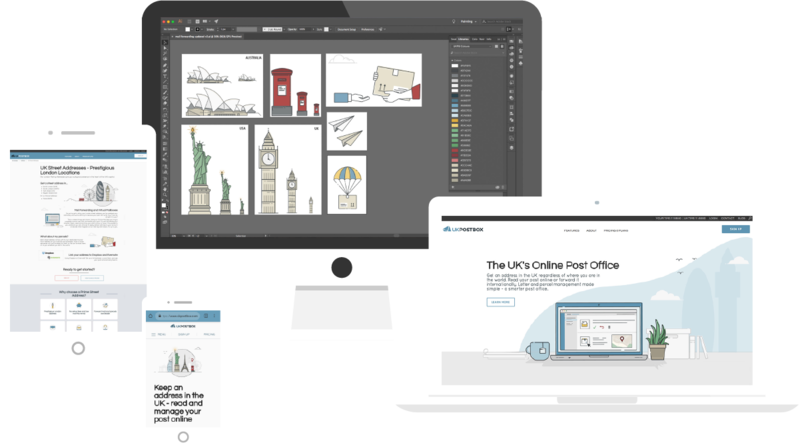 The bespoke illustrations gave us the flexibility to show the key features of each service, supporting and bringing the written content to life. The icons needed to be uniform and balanced in appearance, so we used a grid system and a strict limit of 3 colours. Alongside the new website, the bespoke illustrations, iconography and updated colour scheme have provided our client with a unique brand identity, that achieves their goal of portraying trust and professionalism. We were looking to work with a company that could bring new ideas and a fresh approach to our established brand. With trust being a huge part of our service, it was essential that the illustrations and branding were to the highest standard and portrayed our professionalism. The services we provide can be at times difficult to communicate, even with words. Digital Mast were able to take our services and turn them into attractive, easy to digest and accurate representations of what we do. The consistency across the graphics, including the icons, is testament to the attention to detail Digital Mast put into their work. We couldn’t be happier with the outcome, thank you guys for the great job.